This is another super simple show-stopper of a dish (even simpler than the sinfully delicious mushroom bourguignon) but you need a bit of advance prep. Or in my case, the 5 day miso marinade was perfect when I spotted black cod on sale but already had my meals planned for the beginning of the week. Once you buy fish, you need to cook it soon. But you can wait a bit while it marinades in miso. This is the popular Black Cod with Miso, made famous by Nobu. I was excited to try it at home after I had it at an overpriced Toronto restaurant, since it was darn tasty. Incredibly tasty! Flaky, buttery, melt-in-your-mouth fish with a sweet and salty miso sauce. Absolutely heavenly. I knew I could recreate heaven in my kitchen, so off I went. There are a few recipes for black cod with miso, but I eventually picked something that didn’t call for a pound of miso but still came courtesy of Nobu Matsuhisa. It was in Food & Wine (July 2008). This is my submission to Ivonne at Cream Puffs in Venice for Magazine Mondays. I love that quote. While I often eat alone, food is definitely a way to share with others. To share time, to share conversation and food comes second. The love that was put into a meal says a lot to me. I love cooking, but sometimes find it stressful when cooking for others on a timeline. I have to remind myself it is the company that matters most, not necessarily the meal. Even if I get picked on for lousy cooking (Good Friday 2009 will never be forgotten! arg!). I wanted to highlight this dish as the finale of my spotlight on eating for 1 (even if the photo doesn’t do it nearly the justice it deserves). I cooked it for 4, though, when I had friends over for dinner. Perhaps it was the company that made it special, but this dish was truly phenomenal. Coupled with great friends, games, laughs and good food, you can’t go wrong. I served it with spaetzle, which is a German egg dumpling. My mom makes the most fabulous spaetzle and I automatically figured she had a family recipe in her armamentarium. Nope, it turns out it is from The Joy of Cooking. It can be a bit challenging to make spaetzle to get the proper shape without the proper tools. There are presses specifically to make spaetzle, which is what I use, but you could also use a colander with large holes. You basically force the dough through the holes to make short strands of dough. You could also cut off small pieces of dough from a cutting board, which I have also done in my pre-spaetzle maker era. 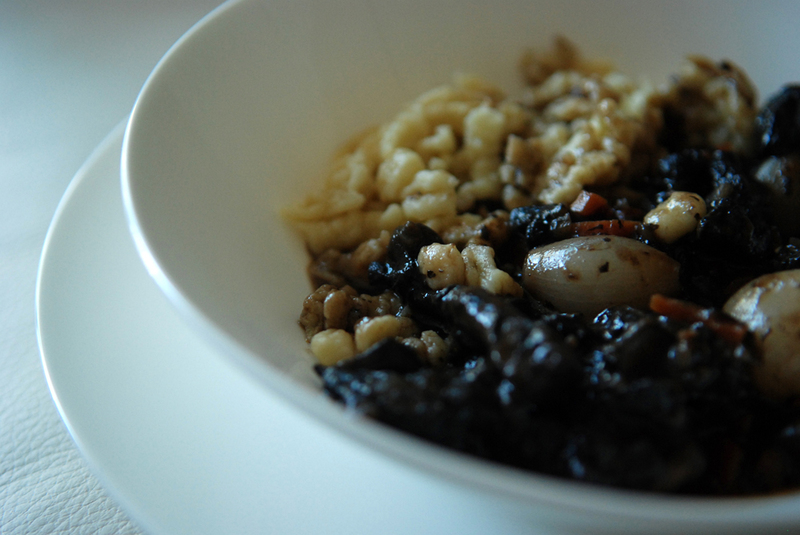 The mushroom bourguignon would be delicious with a side of egg noodles, too. This is my submission to Tobias’ 13th Mediterranean Cooking Event, featuring dishes from France. In my journey of sharing some delicious meals for one (but still complete with leftovers), I finally tackled polenta after seeing it pop up in Madison’s What We Eat When We Eat Alone. Polenta was been on my ‘to-try’ for while due to its high marks in both thriftiness and wholesomeness. 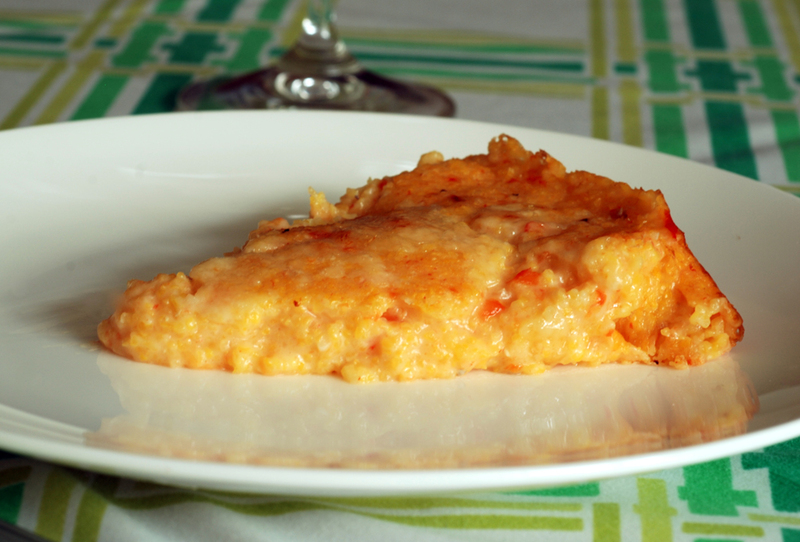 While perusing the The New Mayo Clinic Cookbook (with the recipe also posted here by the Mayo Clinic), the creamy polenta with roasted red pepper coulis beckoned. While a bit time intensive, it was absolutely delicious. The long cooking time allowed for a very creamy, smooth polenta without the need for added cream or cream cheese. I was initially perplexed how the polenta would still be creamy despite a 15 minute baking time, but it allowed it to keep its shape while still being creamy- perfect for serving. It firmed up a bit as leftovers but was still really good. There was a bit of cheese in the polenta, which I thought was more than enough to infuse a subtle tang of Asiago and the red pepper coulis, with the garlic, made sure this wasn’t a bland cornmeal dish. This is my submission to this week’s Weekend Herb Blogging hosted by Haalo from Cook (almost) Anything at Least Once (who also currently runs the show!). When I first heard about someone writing a book on what people eat when alone, I initially thought they should just come to my blog! Most of my dishes are things I cook for myself, even ones that serve 6. I know some people hate leftovers, but I love them! It means I can eat something without much preparation and my favourite dishes are one-pot meals that taste better with age. Soups and salads are great in this category as they improve with time. 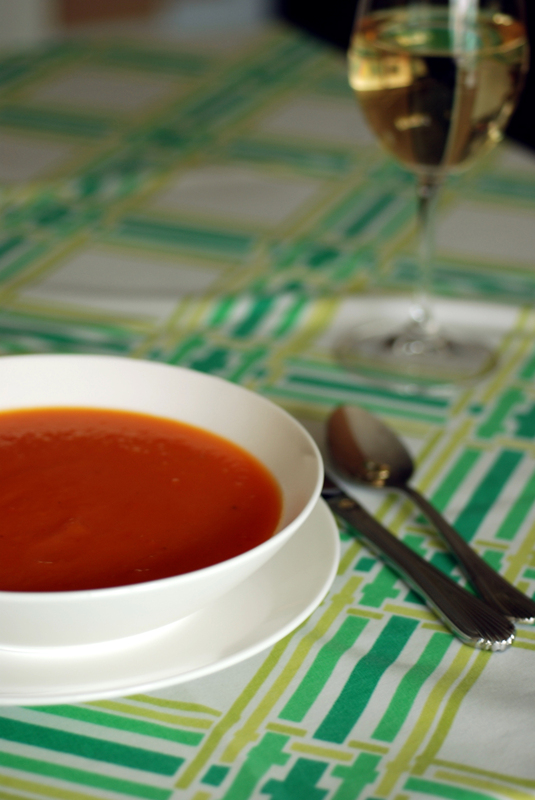 This is a very simple soup, with only 4 ingredients, but the results are beyond simple. Freshly roasted peppers are combines with sweet squash (butternut, buttercup, etc) with a flavourful stock and an onion, and you have a powerful soup. Season well with salt and pepper. The hardest part is roasting the red peppers, which I recommend over the jarred variety as they taste a lot better and it isn’t that difficult. You can roast more peppers to save for other dishes, as I do as well. 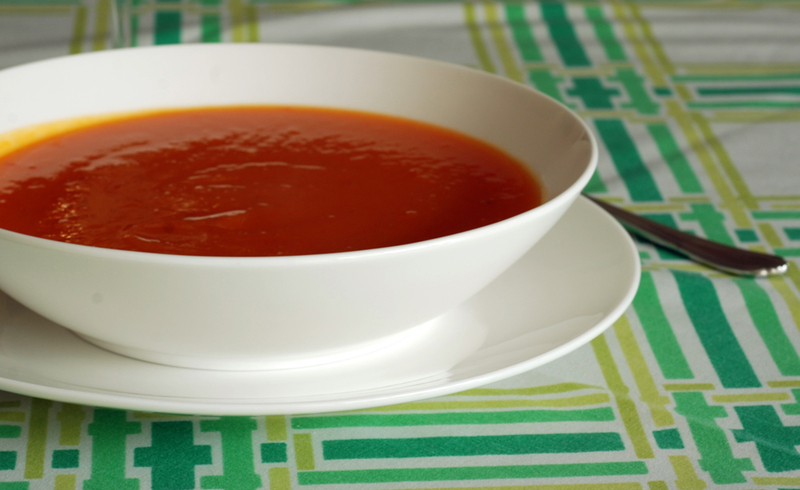 It was adapted from Saved by Soup by Judith Barret, which is a cookbook dedicated to simple healthy soups. Enjoy the soup with a crusty piece of bread or with a light main dish. I served this along with Creamy Polenta with Roasted Red Pepper Coulis as I just had to throw in an extra red pepper to be roasted, and its recipe will follow in the next post. This is my submission for this week’s Souper Sundays with Deb. One of the great things about cooking and eating for yourself is that you really only have to please yourself. The shackles of what a “typical” meal can be broken. This is when I can eat breakfast for breakfast, lunch and dinner! Personally, I think that if a meal is good enough for the start of your day, it is also good for the middle and end as well. There are naysayers out there. I know, because I have tried to feed friends breakfast meals for dinner with protests (‘this isn’t enough to eat! this is for breakfast!’ hmmpht! well what do YOU want to make instead?). To be honest, when I come home from work, the simplest meal is to throw some oatmeal and milk into a pot, stir and enjoy… or devour dry cereal with some milk (my last ditch effort, I swear, used only when I would come home after working 36 hours, just wanting to sleep but with a hungry belly and nothing else in the fridge). But I try not to do that very often. But I will eat granola around the clock. 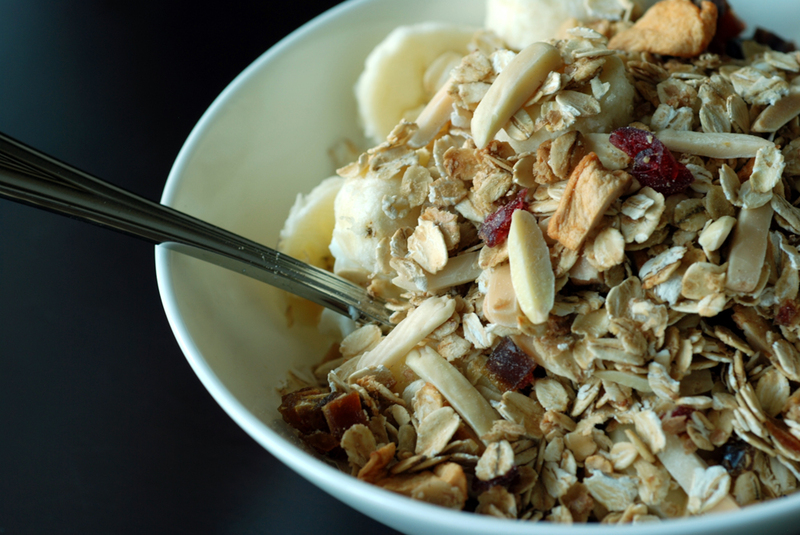 There is a magic behind homemade granola. I don’t know what it is, but it evaporates quickly. Even if I make 6 cups, it is gone within a week. I start by eating it for breakfast, with some yogurt and fruit, and then it also turns into a dessert after dinner.. and after a while, it is my whole dinner. Once I start, I just can’t seem to stop. I posted a delicious Crunchy Coconut Macadamia Granola with Honey earlier, and I really like the simplicity and wholesome-ness of this granola. 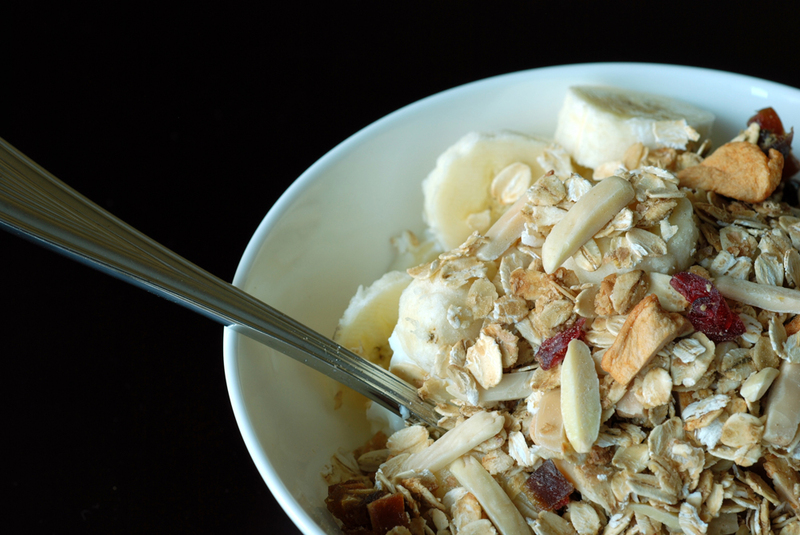 It was adapted from Eat Me, Delicious, who originally found it in The Best Life Diet Cookbook, and it isn’t as sweet as my previous addictive granola. This one is more subtle. Not much clumping, which is typically due to sugar and butter. 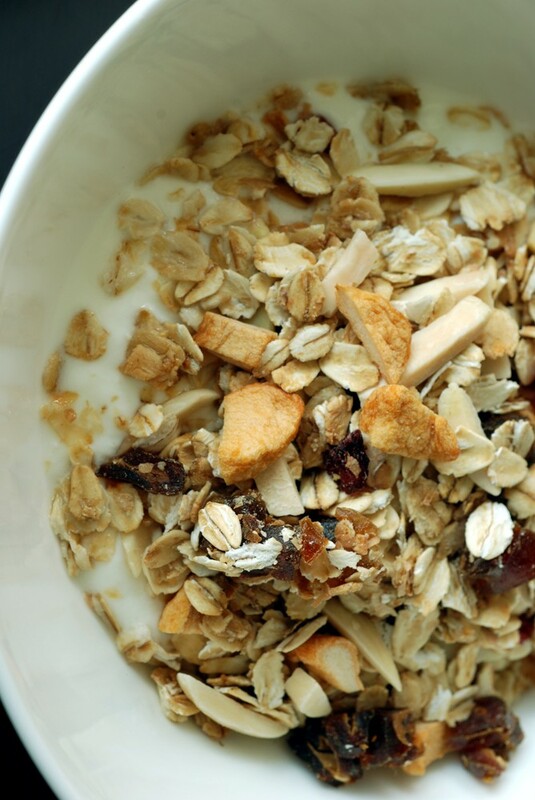 This granola is low in fat but still high in flavour and best served with yogurt and fresh fruit. 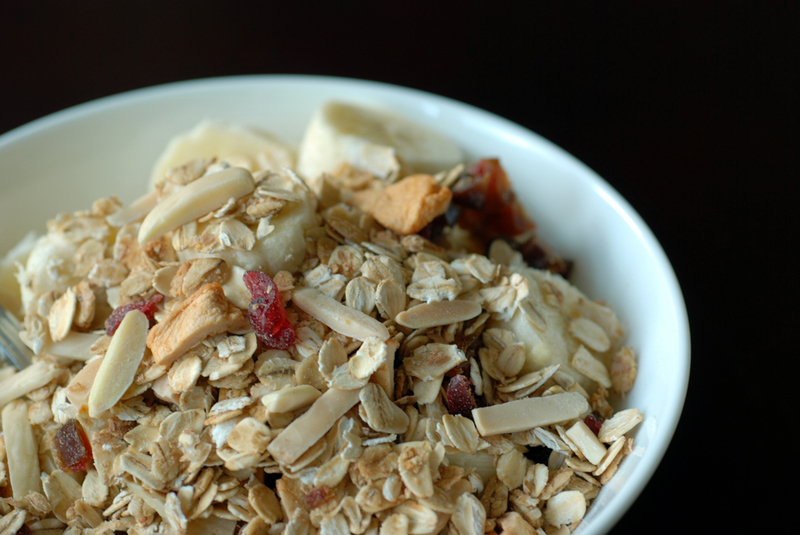 Like all granola recipes, it is flexible to meet your own tastes – feel free to sub in different dried fruit and nuts. I recently read What We Eat When We Eat Alone by husband and wife team Deborah Madison and Patrick McFarlin. If you haven’t heard about it, definitely watch this youtube video promo here. The premise of the book was to figure out what people eat when they only have to cook for themselves – they may be single or rather when their usual partner(s) in crime are away. It was an interesting glimpse into how people indulge while treating themselves, or rather how they don’t treat themselves while alone. 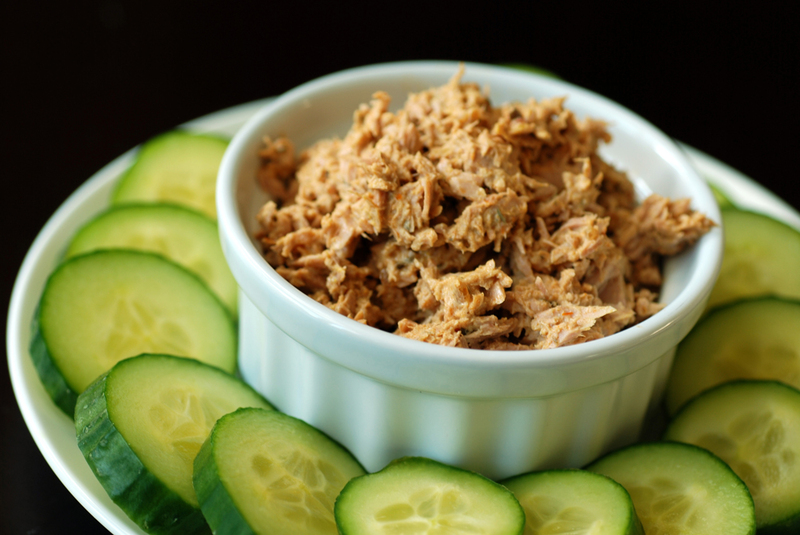 Some forage through the fridge and whip up a simple dish and others scout out foods their partners usually do not like. Others spend that extra mile to make a dish they know they will love. Everyone has a different relationship with food. 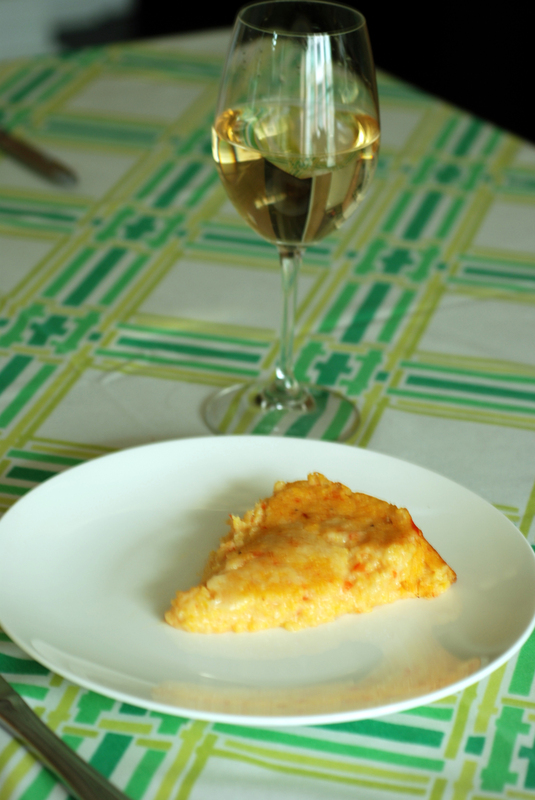 There are recipes sprinkled throughout the book, as people shared their solo suppers, and I thought it would be fun to share some of my own guilty pleasures that I love to eat when dining solo. I was surprised at the responses in the book, but mine are equally as varied, depending on my mood, energy and taste. While I haven’t decided what to do with my current 2 bananas, I knew I had to share one of my favourite overripe banana recipes. 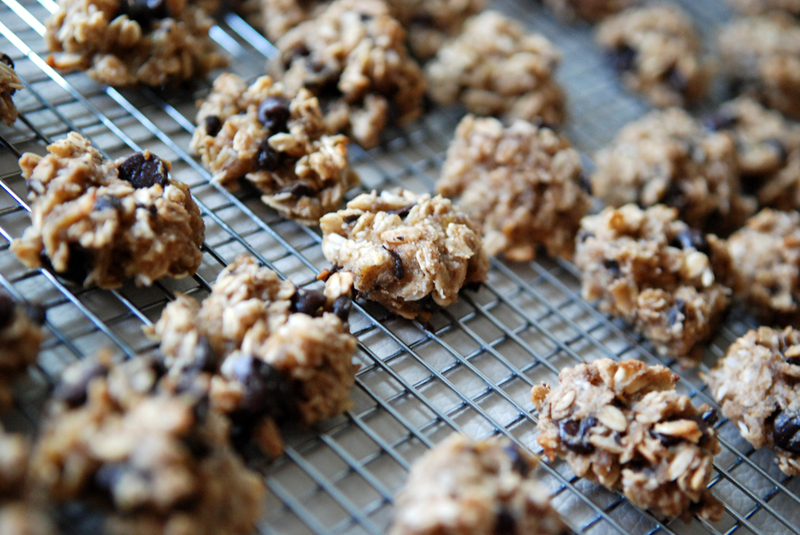 I spotted them on 101cookbooks where they were dubbed “Nikki’s Healthy Cookies”. Let’s ignore the term healthy cookie, because I don’t really think they exist.. I mean, these are filled with many wholesome ingredients with no butter, no eggs, no flour and no added sugar. But let’s be honest, taste is what matters most. And these cookies deliver. They have a slightly crunchy exterior with a soft and chewy centre. They don’t taste like your typical cookies, as they are lighter than most cookies but not exactly cake-like either. 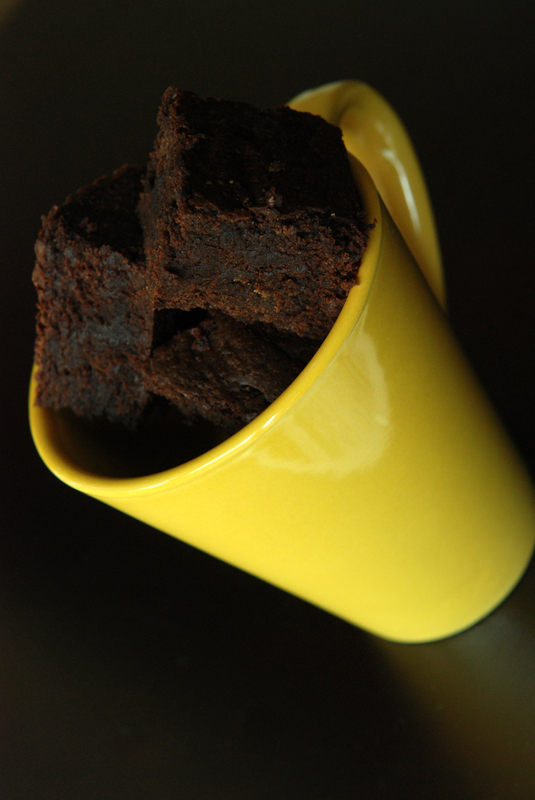 Straight from the oven, the melted chocolate dances on your tongue with the strong whiff of banana, which provides the soft texture. 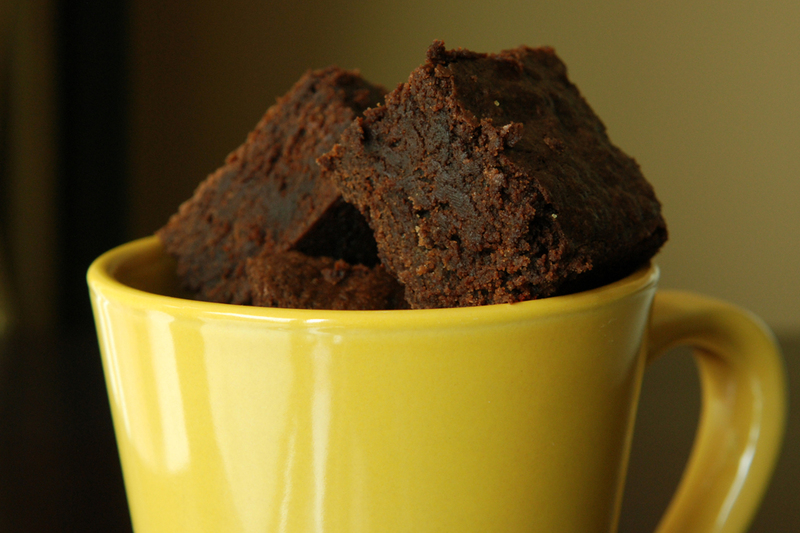 The ground almonds replace flour, making this a perfect treat for vegans and celiacs alike. I am not sure how long the cookies will last at room temperature because they never seem to last more than 2-3 days. This is my submission to this week’s Weekend Herb Blogging hosted by Astrid from Paulchen’s Foodblog. Whenever I cook for other people, I am torn between trying a new recipe on unsuspecting partners in crime, or sticking to some tried-and-true recipes. I battle between knowing a dish will be great, to the possibility that I might find a new dish I love as well! Or if I don’t, others will help me eat it (just kidding!). 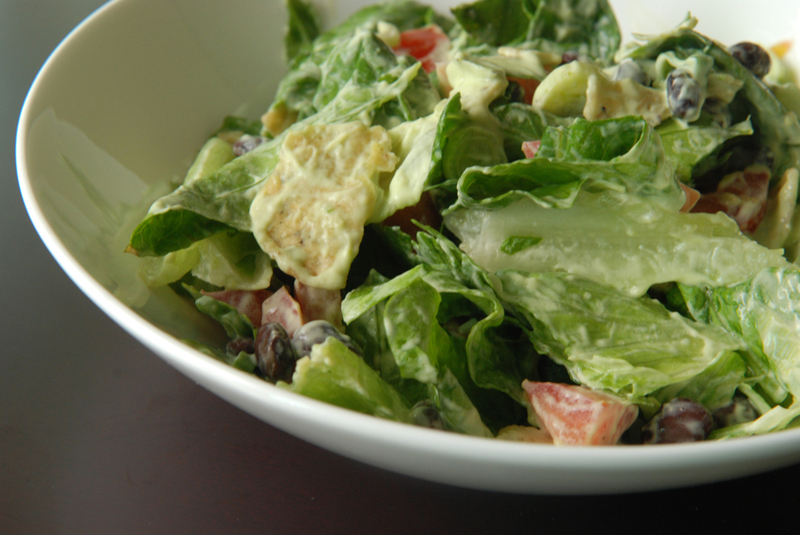 Certainly some dishes lend well to large gatherings, like creamy lettuce salads.. because they just don’t last until the next day. So when I was confronted with meeting (many!) strangers over a potluck, I erred on the side of trouble, and a large salad (salad = trouble ? No way!). Thankfully, this gamble paid off. I taste-tested it before I brought it over, so I knew I wasn’t doomed to disaster. I must admit I don’t make many creamy dressings, and my only mayonnaise is Japanese (courtesy of okonomiyaki cravings), but the majority of this dressing was entirely avocado. It was pretty scrumptious and the green onions had a small kick of heat that balanced out with the avocado nicely and while I omitted the hot sauce, I am sure it would have been nice for those who enjoy more spice. 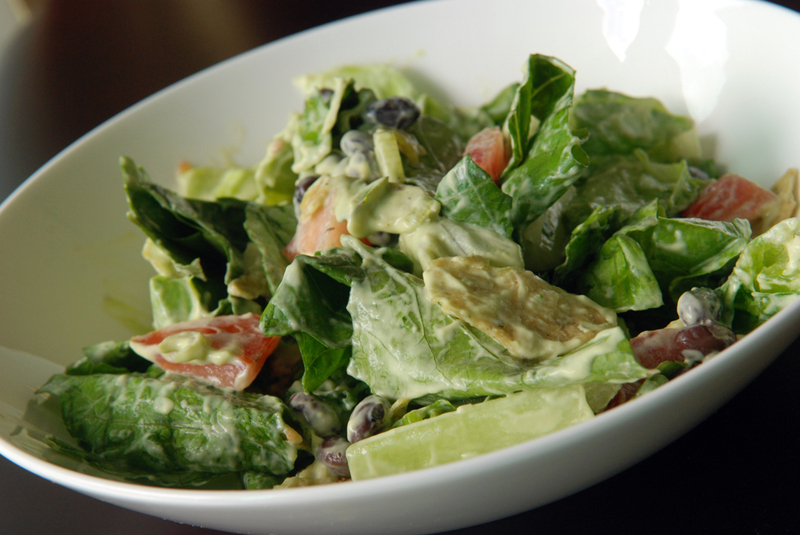 The Romaine and chips had nice crunch that complemented the rich creaminess from the dressing. The black beans were a nice addition too. I am reminded how much I love creamy salads and now I have to wait for another grand gathering to make such a monstrous salad a second time. Enjoy! This dish was adapted from Noble Pig, and also spotted at Krista’s Kitchen. It is my submission to this month’s No Croutons Required featuring Mexican soups and salads as well as this month’s My Legume Love Affair hosted by The Well-Seasoned Cook. 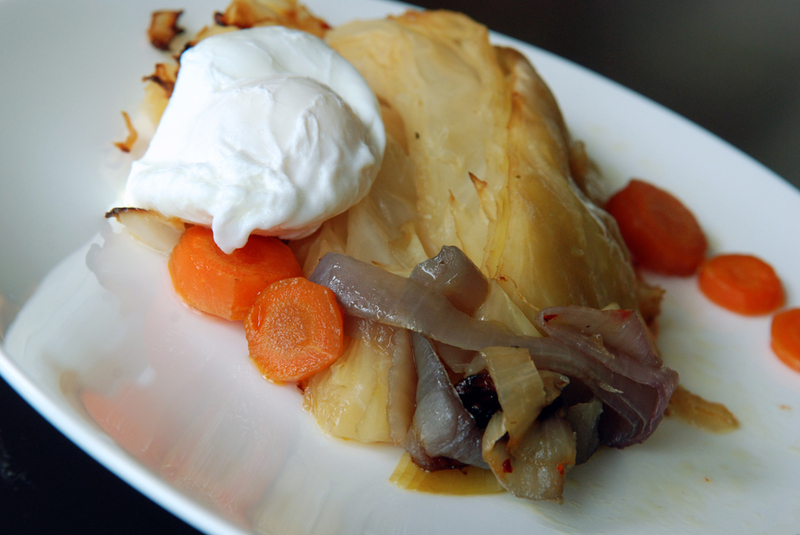 Allow me to introduce you to the sweetest cabbage you ever did taste, and the sugar comes entirely from the cabbage itself (and perhaps the onions and carrots). 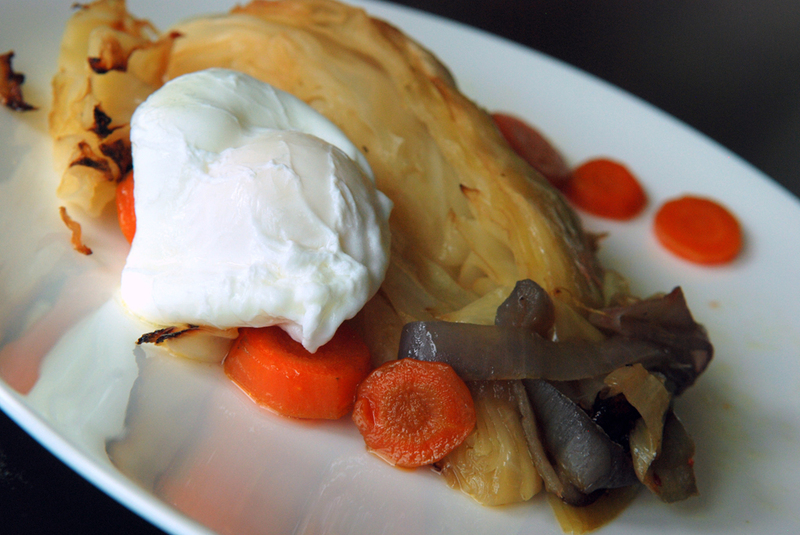 Cabbage is an under-appreciated vegetable but this recipe will change the cabbage haters. Cabbage is surprisingly tasty (especially like this! ), but also a good source of vitamin C and fiber. It is relatively cheap (cost and calories) and so filling I usually can’t finish a whole head of cabbage myself. However, this meal was so good, I feel like going out to get another cabbage to make it a second time! 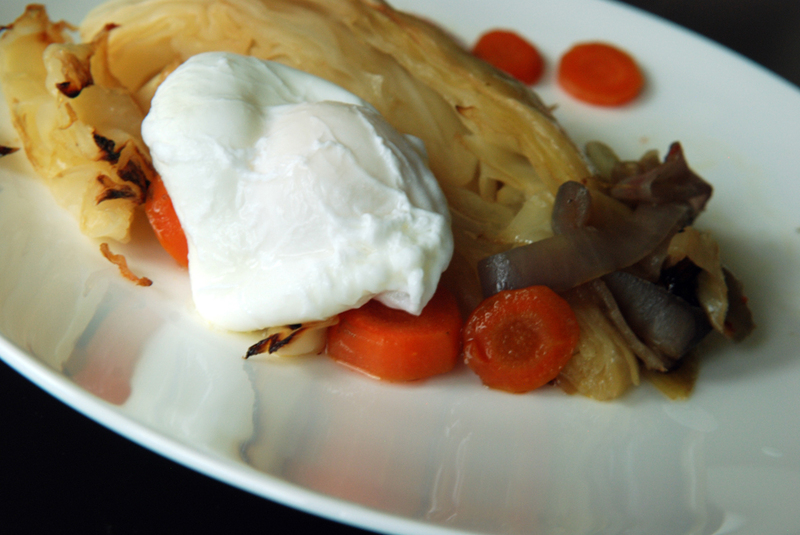 Cabbage is a popular ingredient in Eastern European cooking and braised cabbage is common to many cuisines (sometimes tomatoes are also included). It is mostly a side dish. 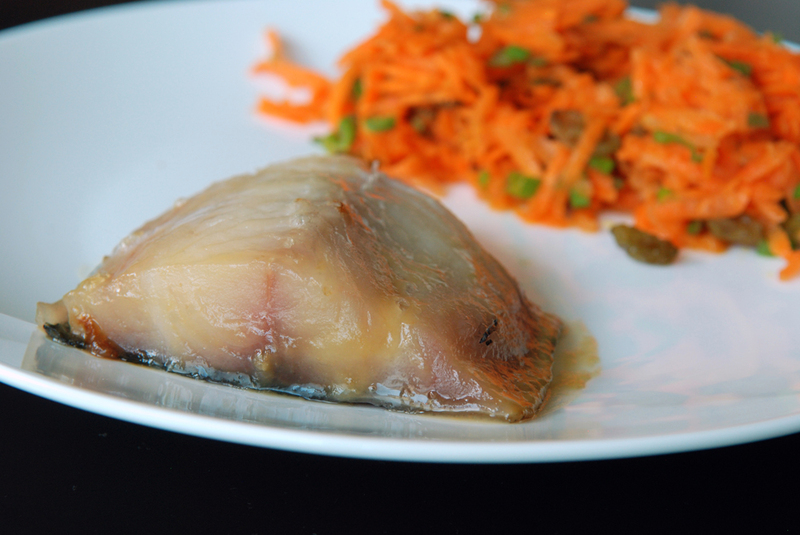 This is my submission to this month’s AWED featuring dishes from Russia. My liberty was experimenting with braised cabbage, although this specific dish may not be entirely a Russian authenticity. This recipe was adapted from Orangette, who adapted it from Molly Steven’s recipe in All About Braising. After perusing a few carrot salad recipes, I eventually honed down to this one from a new cookbook, Good Food For All, from The Stop. The Stop is a community food centre in Toronto that is not only one of Canada’s oldest food banks, but also has a social mission to empower its community users to eat healthy through cooking classes and sustainable food education, community cooking, community oven bakes and food markets. They also have a 10,000-square foot garden, The Green Barn, which is used to produce their own food and a focal point to encourage and learn about sustainable, local, healthy produce. Joshna Maharaj, one of the chef at The Stop, gave a talk at my work, encouraging cooking at home. Chefs are more glamorous than ever in popular culture, she explained, but less people are doing any sort of home cooking. The Stop’s first cookbook, Good Food For All, is an amazing collection of seasonal, local dishes that are healthy and economical, with every dish developed by Joshna Maharaj (with collaboration from volunteers, other chefs, etc) and served at one point at The Stop’s community kitchens. They are hopefully a springboard to get people eating at home without too much fuss. There are many recipes I wished to try amongst the 80 featured in the cookbook. It is thrilling to have them organizing by season, when it matches my own seasonal and local ingredients (Toronto seasons!). 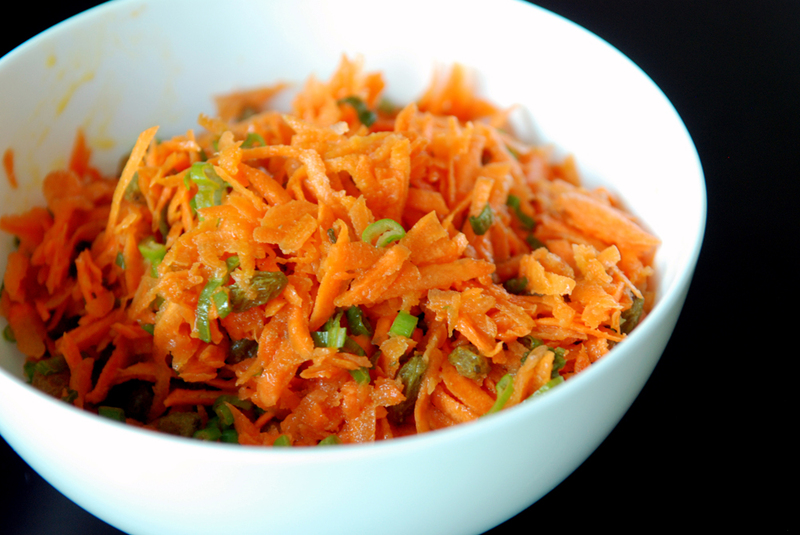 I started with this delicious carrot salad with Moroccan overtones. It was absolutely delicious with the subtle tang from the apple cider vinegar with the smoky cumin, interlaced around sweet shredded carrots. The scallions gave a subtle hit of heat and surprisingly, I loved the raisins! I used Iranian green raisins, which are less sweet than typical Sultana raisins and have citrus notes. They paired perfectly with this salad. If the rest of the recipes in this cookbook are like this, then I will be hooked. My only beef with the cookbook is that many recipes rely on a food processor. While I consider myself to have a well-stocked kitchen, I do not have a food processor. For those with lower incomes, I imagine they wouldn’t have one either, which makes some of the recipes more difficult to tackle. This is my submission to this month’s Cooking with Seeds featuring Cumin. While in Turkey, I had wonderful Turkish rice pudding (Sütlaç) that was silky smooth and sprinkled with cinnamon. I never liked rice pudding as a kid (sorry Mom!) but can I blame that on my own bland taste buds as a child or the rice pudding? My brother loved the stuff, so I don’t know.. 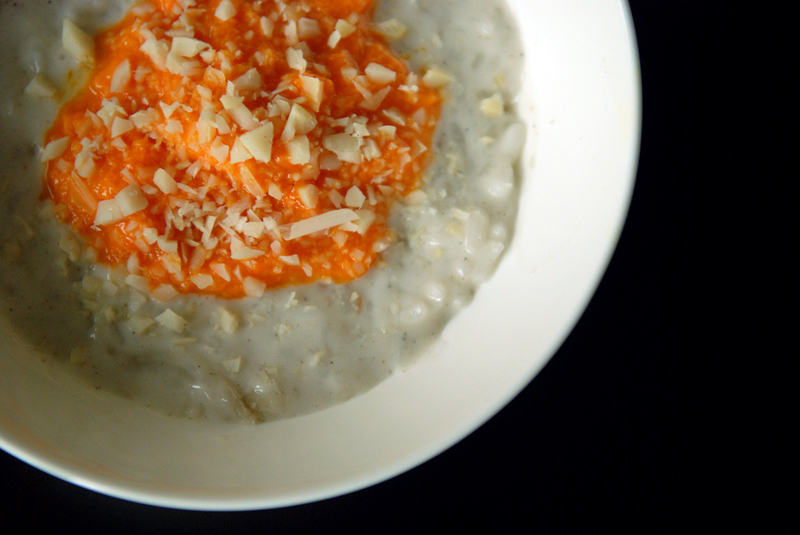 In any case, this, my friends, is a delicious grown-up rice pudding. I approve. After making the Mango Sticky Rice and Mango Shrikhand, I decided that mango, coconut and cardamom work really well together, so I rearranged them a bit to make this wonderfully delicious (and easy!) 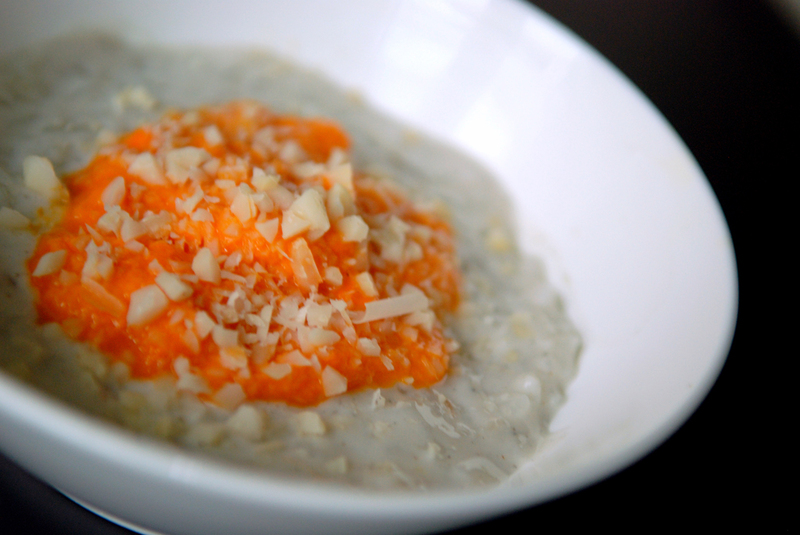 coconut rice pudding that was topped with a mango puree. The coconut rice pudding was delicious on its own, with flavours bursting from the coconut and cardamom with the creamy rice speckling the pudding. I mashed half a mango and added it on top of the pudding, which was great, but certainly do not hesitate to make this pudding without the mango. You can eat it plain or top with other fruit – banana, raspberries, kiwi, etc. The nuts are totally optional as well. I used chopped macadamia nuts but think toasted pistachios would have been better, or simply not use any nuts at all. It can be served cold or warm. Personally, I couldn’t wait long enough before diving in, so I had it warm… Eating it chilled would be just as delicious and perfect for a cool summer day. 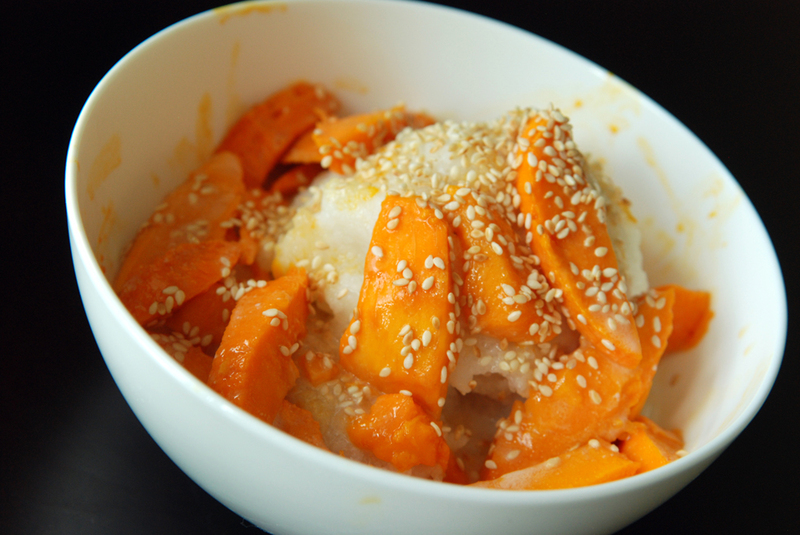 This recipe was adapted from Closet Cooking who also has a host of other mango recipes on my to-try list! This is my submission to this week’s Weekend Herb Blogging hosted by Marija from Palachinka. O mango, how sweet you are! I used to wonder why mess with mangoes when they taste so good all by themselves? I love pretty much all (heat tolerable) dishes with mangoes, but when I have delicious fresh mangoes, I just want to eat them the way they are. 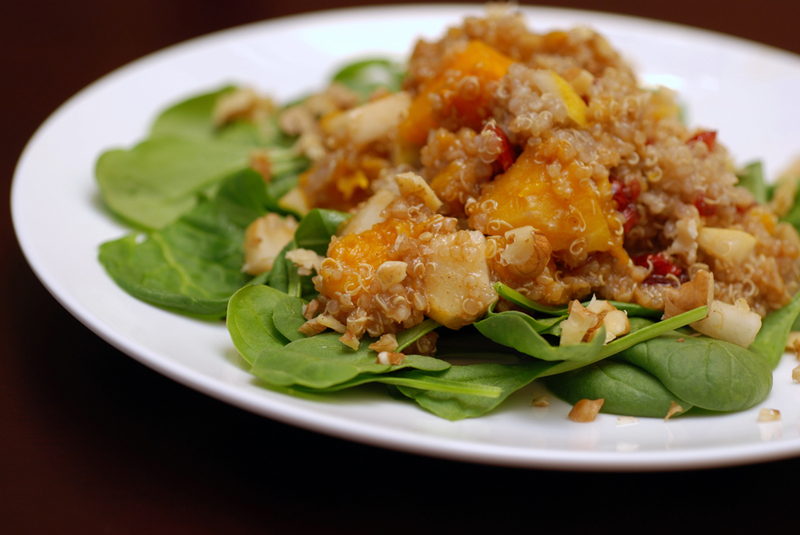 I find it hard to incorporate the mangoes into a dish that may mask their flavour. 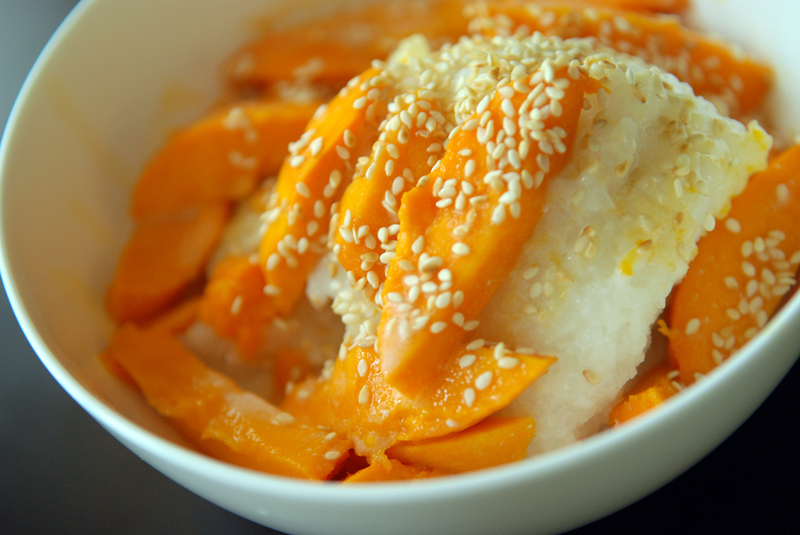 No worries with Mango and Sticky Rice, because mango and coconut are simply meant to be together. They are definitely better than the sum of their parts alone. 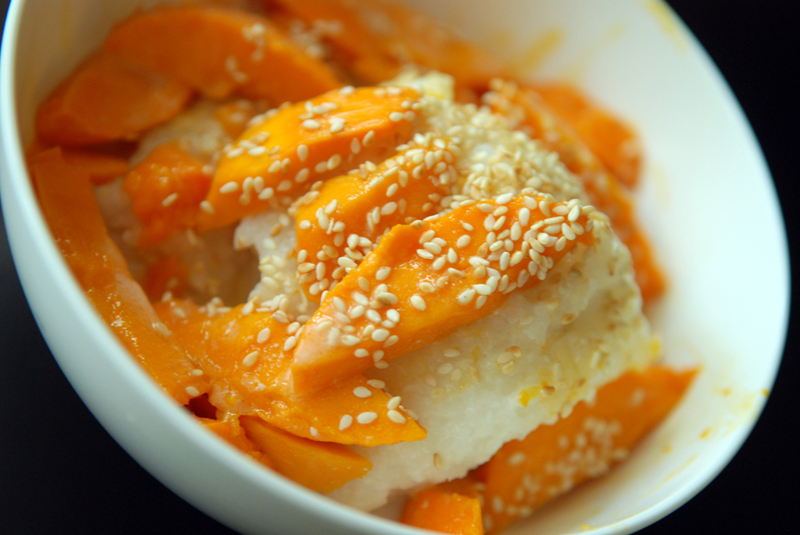 The sweet coconut creaminess envelopes the juicy Alphonso mangoes on a bed of creamy, yet sticky, coconut-flavoured rice. 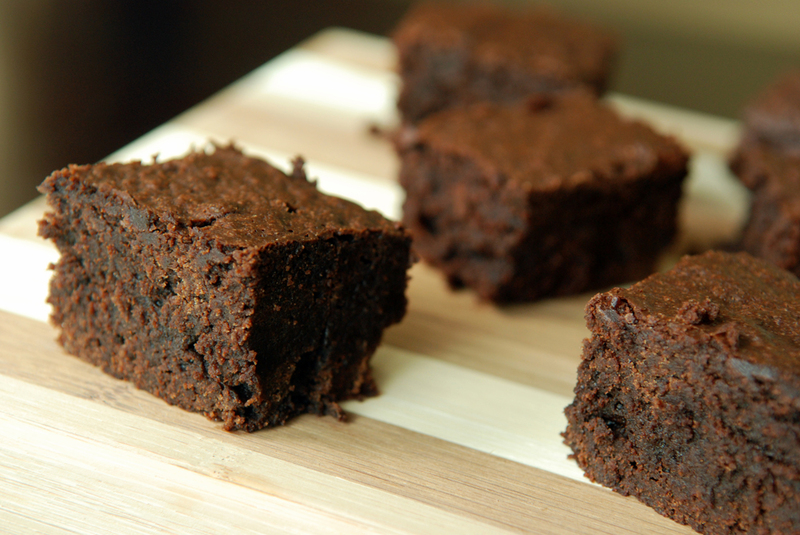 The benefit of making this dish at home, is that you can make the dish as sweet as you want. Not much sugar was needed to be added when the mangoes are brimming with taste. 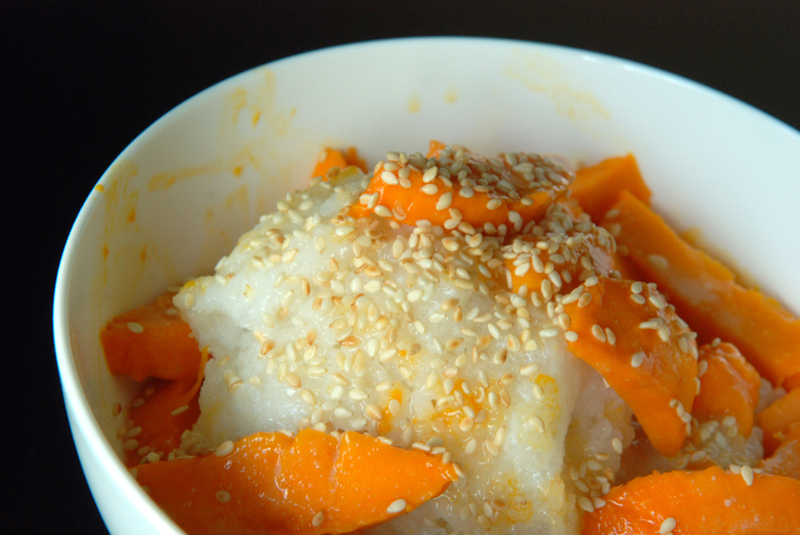 There are many recipes for Mango Sticky Rice, but I adapted my version from Taste Buddies. This is my submission to this week’s Weekend Herb Blogging hosted by Cafe Lynnylu. 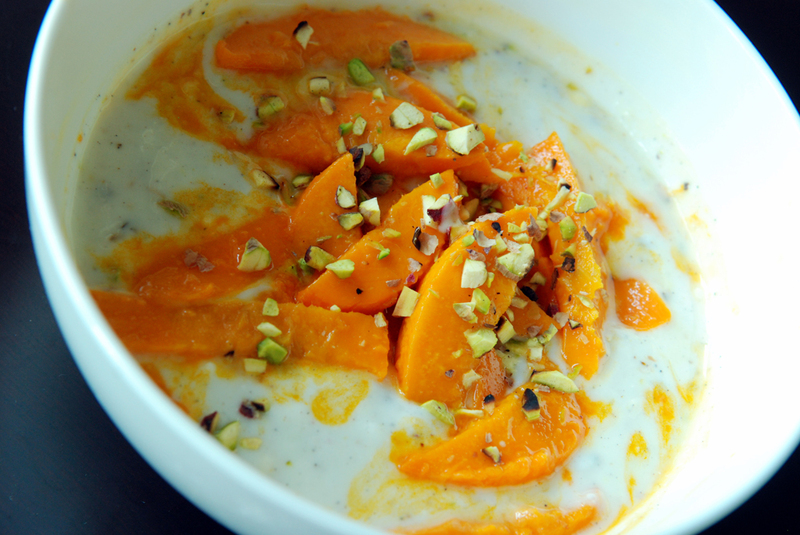 Mango shrikhand is an Indian dessert, popular in Gurjarat (incidentally where mangoes are grown). 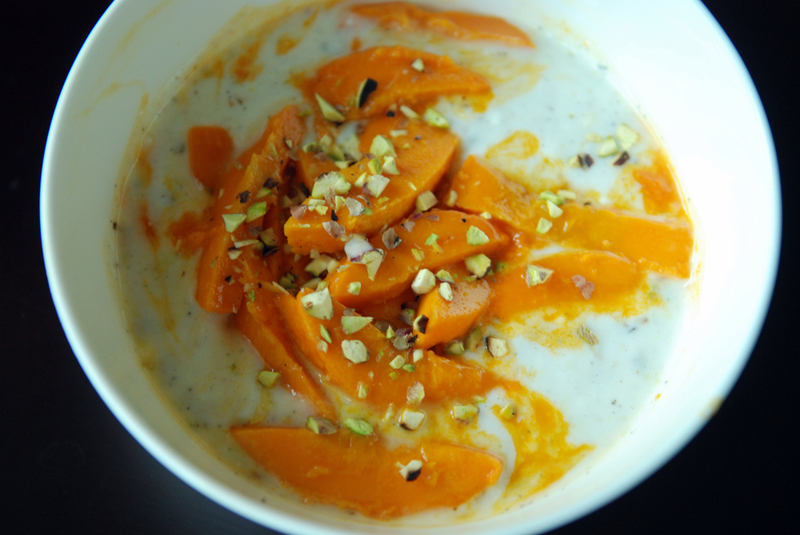 Cool, strained yogurt is mixed with cardamom, saffron, sugar and (in this version) pistachios as well. 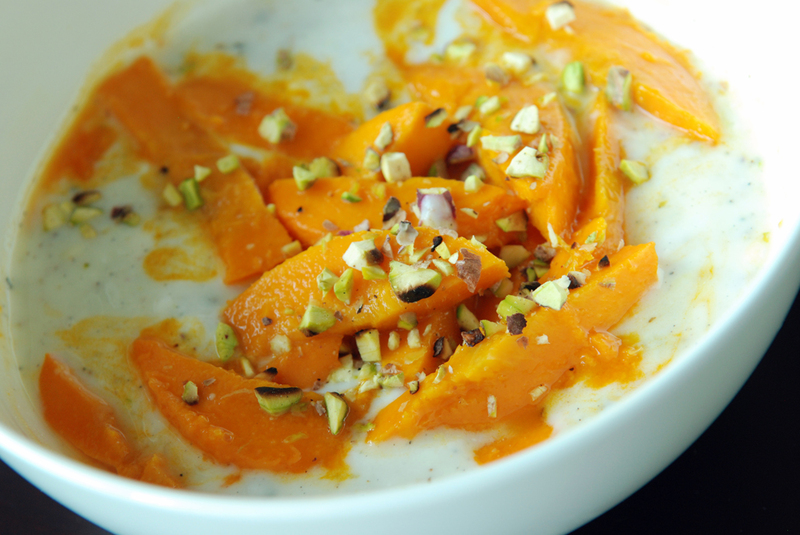 It is topped with the sinfully juicy mango slices with a sprinkle of chopped pistachios. The Alphonso mangoes, utterly sweet, really shine in this dish. 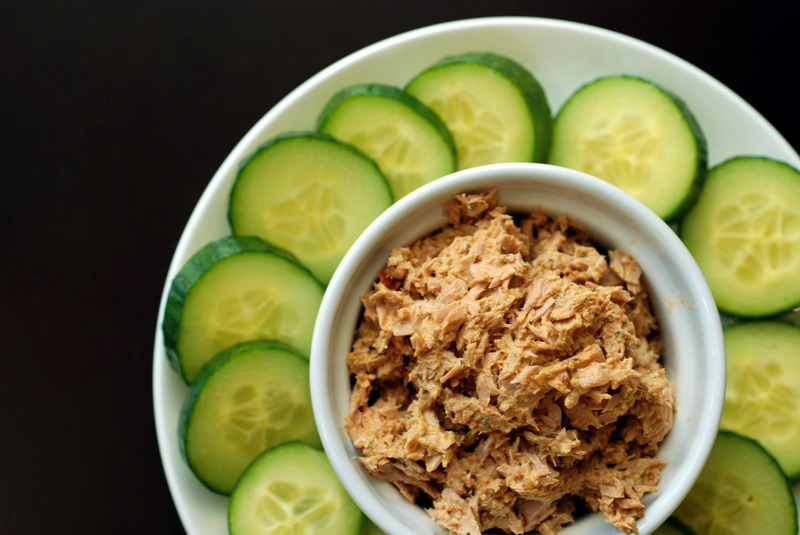 This recipe is adapted from Closet Cooking, and is really, really good. I know it is important to have the proper consistency of yogurt, which is why people recommend to drain it in a cheesecloth overnight, but I used Greek-style yogurt instead. It was thinned with the additional ingredients. Definitely taste as you go, adjusting the sweetness based on your ingredients. Alphonso mangoes are arguably the sweetest mango you can find. They are imported from India, and only recently, in 2007, did the United States lift their 18-year import ban. The recent volcanic eruption in Iceland caused a glut of Alphonso mangoes at the Gerrard India Bazaar in Toronto but I found some at the Cash and Carry over the weekend. They are definitely worth the extra price as they are just bursting with juice. Every time I cut one, I did it over my dish to catch all the runaway juices, and then proceed to lick my fingers clean as to not miss any of the sweet mango goodness. This is my submission to this month’s Cooking with Seeds featuring Cardamom. Alas, I was getting ready to write my post about my love of Alphonso mangoes, but figured I should shed my winter meals first before jumping headfirst into spring and summer dishes. With a balmy 15C this morning on my way to work on my bike, I am happy as a peach.. sweet as a mango? 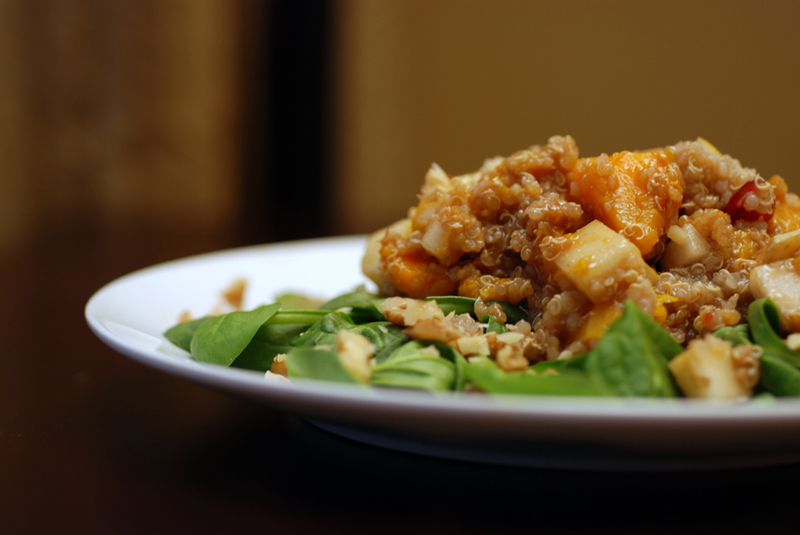 One of my favourite things to eat in the winter is butternut squash. Or buttercup squash. Any squash, really. When roasted, they are incredibly sweet and work well with many sweet and savoury flavours. 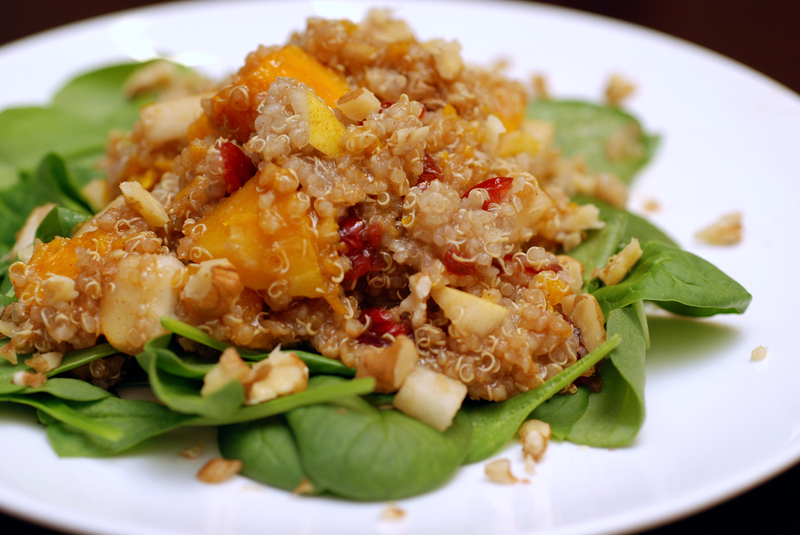 For this dish, adapted from Lou Seibert Pappas’ A Harvest of Pumpkin and Squash, the savoury side of a butternut squash is combined with cinnamon- and sesame-laced quinoa mixed with cranberries and pear. This is laid on a bed of welcoming spinach and topped with a balsamic vinaigrette. This is my submission to Ricki and Kim’s SOS Kitchen Challenge, featuring sweet or savoury natural vegan cooking highlighting spinach this month.